This lesson covers methods of using database 'wildcards' to perform complex searches not possible by ordinary methods. The numbers mentioned in these Instructions were valid on 10th April 2011. In database searches a 'wildcard' is a character that is used to represent any or many normal characters. At Northamptonshire Wills the _ (underscore) character is used to represent a single instance of any normal character of the alphabet as well as any number. To search multiple instances of any characters the * (star) character is used. The primary benefit of using wildcard characters is that it provides a simple way to search for misspelled names. By using wildcard characters you can group alternative spellings together, plus, hopefully discover variations of spelling you had not considered. In simple terms, all you do is place the wildcard character into your search name instead of normal letters. Lets assume you are interested in the name FARMER. So you enter into the search box FARMER. As of 10Apr11 you would end up with 18 Wills. A close inspection of this Will will reveal that even in this single Will the person writing it apparently changed the spelling from FARMER to FARMAR. Because of this both variants of the spelling appear in the Mentioned field. Note alternative spellings do not normally appear in the Mentioned field. Only because in this instances both spellings appear in the Will they are also included in the Mentioned field. Appreciating that there are now two possible spellings of FARMER you can now use the '_' wildcard to do the search again. Searching for 'FARM_R' will find both FARMER and FARMAR. 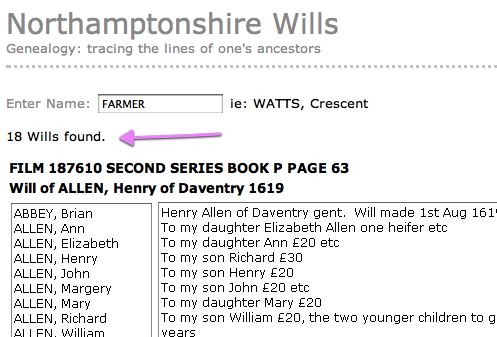 Entering FARM_R into the search box results in 21 Wills found, 3 more than previous. By scrolling down the Summary display you'll discover that not only has the search picked up the spellings you were looking for; FARMER and FARMAR, but an unexpected spelling FARMOR . This highlights the fact that the _ wildcard will substitute any letter or number in it's search, therefore if they existed, it would have also found FARMIR, FARMUR and FARMRR. Note a good place to use wildcards is in place of vowels as these are commonly mixed around. The * wildcard is a single character that looks for none, one or many letters or numbers. To understand this lets look at a real life example. A simple search for the name HUMFREY will reveal 39 Wills as of 10Apr11. An alternate spelling of HUMFREY is HUMPHREY . So this is where the * wildcard comes in. A search for HUM*REY and this will find both HUMFREY and HUMPHREY . With the * the database is looking for HUM + * + REY - so if there happened to be a name HUMMERSMITHEREY it would be found. Now it can be see that HUM*REY has raised the hits by 8 to 47 Wills found. An extra 15 Wills over the original search has been found. What is also interesting is that not only have you covered the expected spelling of HUMFREY, HUMPHREY, HUMFRY and HUMPHRY, but you unexpectedly picked up HUMPHRYE and HUMPHRIE . Note that it's actually unnecessary to place a * at the end of a search. This is because the database does that automatically for you. This is why when you search for 'H' you get hundreds of hits because behind the scenes the database is looking for 'H*'. What this highlights is the * wildcard not only looks for many combination of letters and numbers, but also no letters or numbers. Use the _ wildcard for single character replacement. Vowels are a good place to start. FARM_R will find FARMAR, FARMER and FARMOR. Use the * wildcard when search for multiple character replacement. 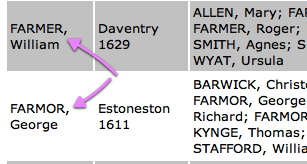 Want to find BENETT and BENNETT, then BE*ETT has both single and double 'N's covered. There is no need to place the * character at the beginning or the end of a search. BE*E will find BENET, BENETT, BENNET and BENETT. The * wildcard is also good for sorting out jumbled spelling. * will find E, I, Y, IE, EY, YE. Wildcards are good for sorting out phonetic spelling; use _ where 'c' and 'k' are mixed around, whilst * is used for 'f' and 'ph'. Go back to Intermediate Lessons or review general search Tips.